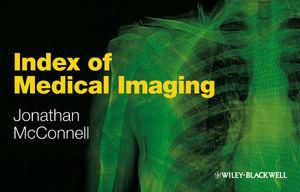 The ‘Index of Medical Imaging' is the must-have companion for diagnostic radiography students and newly qualified imaging practitioners, designed to allow easy access to descriptions and discussions of many aspects of medical imaging such as radiographic projections, positioning, procedures and clinical examinations. The Index consists of multiple lists, tables and discussions linked to (amongst others) radiography, CT, MRI and components such as radiological contrast agents, responses to contrast reactions, MRI safety. There is a glossary of terms and definitions plus a list of abbreviations that may be encountered within radiology. Tables are given that suggest the order and type of examination that should be performed as defined by the UK Royal College of Radiologists. Jonathan McConnell has experience of writing for Blackwell Publishing on two occasions. He co-edited ‘Interpreting Trauma Radiographs’ with Eyres and Nightingale, and contributed to “Paediatric Radiography’ by Hardy and Boynes. He has also written for Carver and Carver’s ‘Medical Imaging, Techniques, Reflection and Evaluation’ published by Churchill Livingstone. He has several other publications via peer reviewed journals and is a member of the editorial board of ‘Radiography’ the UK peer reviewed journal. He has taught at the University of Bradford, held a Principal Lectureship with St Martin’s College and was Head of Department in Christchurch, New Zealand. Currently he holds a Senior Lectureship at Monash University, Melbourne, Australia. Before moving into academia he had 11 years of clinical practice culminating in a position of reporting Radiographer and Clinical Tutor at the Leeds General Infirmary. 5 Procedures Using Contrast Agents +/– Fluoroscopy. 6 Mobile Radiography and Fluoroscopy. 8 Contrast Media, Emergency Drugs and Reaction Responses. 10 Magnetic Resonance Imaging Safety. 11 Magnetic Resonance Imaging Sequences. 12 Typical Effective Doses from Diagnostic Medical Imaging Procedures. 14 Eponymous Injuries and Classification Systems. Appendix 1 Common Radiological and Medical Abbreviations. Appendix 2 Glossary of Common Terms for Medical Radiation Practice. Appendix 3 Typical Normal Blood Values.